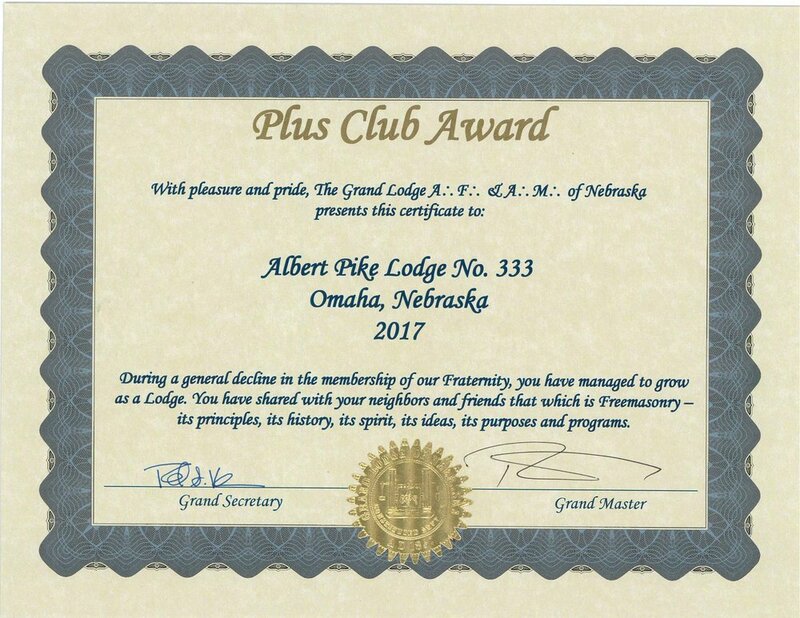 The Officers and Brethren of Albert Pike Lodge #333 stand with the 2018 Grand Lodge of Nebraska award for membership growth for a small Lodge. . .
MW John Maxell, Past Grand Master of Masons in Nebraska and General Secretary for the Scottish Rite presented Andrew Privitera with his 32° Scottish Rite patent at Albert Pike Lodge #333 today. Andrew is a member of Chester Lodge #94 in Chester, Virginia. . .
WB Charles V. Sederstrom, Jr. asked the Senior Deacon to escrow MW John Maxell and Brother Anthony Canty, Jr. to the East. John used the opportunity to present Anthony with his Letter of Patent as a 32° Scottish Rite Mason, who was raised at the William B. Webster, 33° Reunion this past November, 2017. Congratulations Anthony! Albert Pike Lodge #333 recognized for membership growth in 2017. 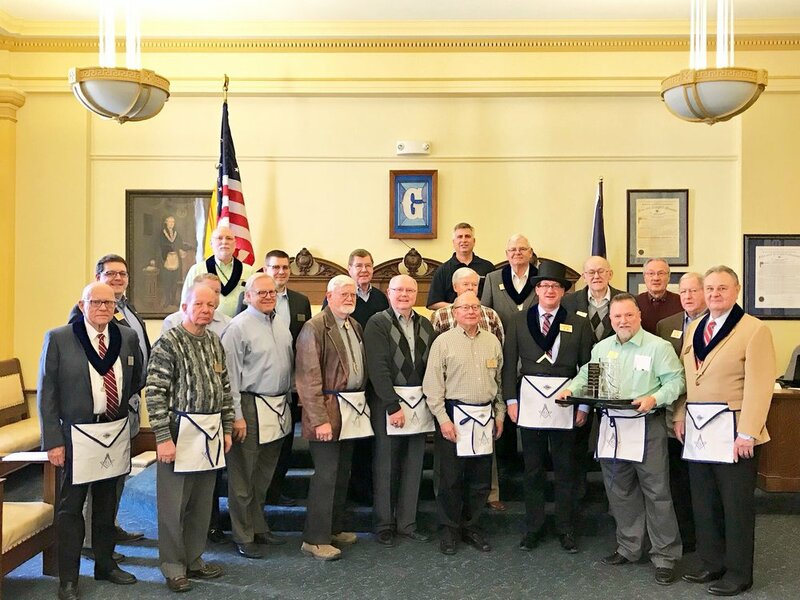 Members of Albert Pike Lodge #333 received the Grand Lodge of Nebraska's award for membership growth for a small Lodge at the Annual Communication in Kearney in February. Pike Lodge began 2017 with 30 members, and during the course of the year raised 4 new Master Masons and brought in one more by affiliation. One member was suspended for non-payment of dues, due to moving out of state and another terminated his dual membership with Pike Lodge, retaining his membership at Nebraska Lodge #1. This gave Pike Lodge a net growth of 3 members, or 10% gain, for a year-end total of 33 members. At present, one candidate has been elected by the Lodge to receive the Degrees of Freemasonry, and 3 or 4 men have expressed an interested in joining Albert Pike Lodge #333 in 2018. In this photo, Steve Barchus, Master of Pike Lodge in 2017, holds the Membership award (standing in the first row, second to right). On his left is Charles Sederstrom III, 2018 Master of Pike Lodge. Pike Lodge Raises Anthony Canty, Sr.
Albert Pike Lodge #333 was proud to raise Anthony D. Canty, Sr. (3rd from left) to the sublime degree of a Master Mason on Saturday, October 21, 2017 in a one-day ceremony. The Lodge welcomed WB Mike Gray from Hickman #256, WB Jonathan Paz from Papillion #39, and WB Mark Miller from Mizpah #302 who helped with the degree work. Anthony is the General Manager for Mobile Fleet Service and enjoys fishing and hunting. WB Tom Brummett was presented with the Grand Lodge of Nebraska's Masonic Individual Achievement by Steven Barchus, Master of Pike Lodge, on Wednesday, October 18, 2017. 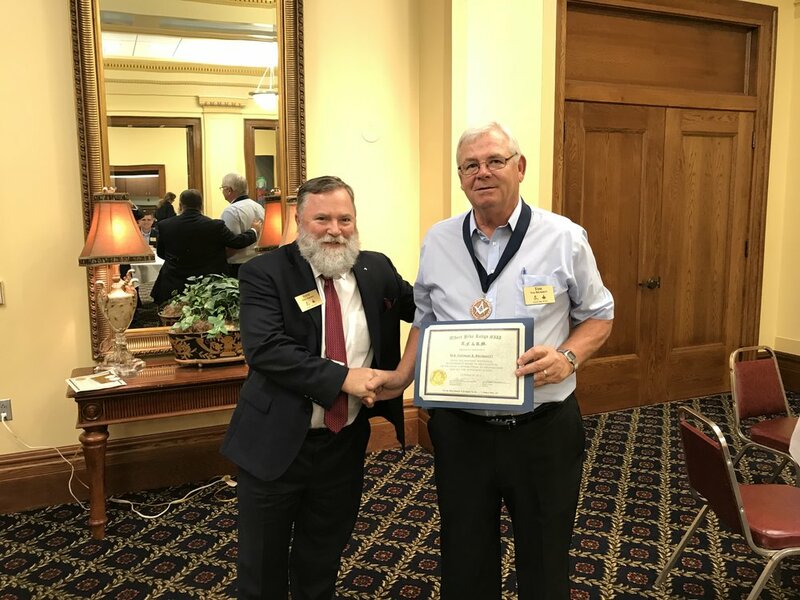 In citing the award, Steve recognized Tom for his commitment to the success Albert Pike Lodge #333, serving as an officer, committee member, conducting Degree work, and serving in numerous leadership capacities for the Lodge, as well as mentor for new members. Tom has selflessly given his time to all Masonic bodies, having served as Potentate of Tangier Shrine, Past Master of Covert Lodge #11. Within the Scottish RIte, Tom has served on the Cathedral Board, as well as volunteering with the stage crew at Reunions. Additionally, he serves as a Culinary Master, cooking at numerous events and volunteers for any other project that may need help at the Scottish Rite and Tangier Shrine. He has run and managed the Hospitality Room at the Grand Lodge Annual Communication. Tom has always been willing to drive to any Lodge in greater-Omaha to promote Blue Lodge Masonry, whenever called upon. Tom is a true gentleman and Mason, supporting all Masonic organizations as a leader as well as philanthropically. At the July business meeting, MW John Maxell presented 32° membership patents to Brothers Don Shiu, Jr., Wayne Stuberg, and Ed Birmingham, who joined in the April, 2017 Reunion. He was joined by the Senior and Junior Wardens, Charles Sederstrom III and Don Kavalec, who served as the Venerable Master of the Lodge of Perfection and Master of Kadosh for the Omaha Consistory officer lines. Prospective Scottish Rite Brethren see the presentation, learn what a Patent represents, and hopefully are encouraged to petition themselves! More important, a special presentation reminds a new Brother of his value and importance in our fraternity, and helps keeps him better engaged. Letters of patent are a type of legal instrument issued by a governing body, granting an office, title or status to a person. In the past, Scottish Rite Masons may have folded their patents up in carrying folders and took it with them in lieu of a dues card when visiting other Lodges. Many old patents were autographed by fellow member’s of his Reunion class, the SGIG, Grand Master, or other VIPs. Albert Pike Lodge #333 had a light-hearted education over lunch in May, watching the classic Simpsons episode "Homer the Great." In this episode, Homer Simpson is inducted into the Stonecutters fraternity. . . The Brethren of Albert Pike Lodge #333 were honored to raise three new men on Saturday, April 22, 2017. Degree work was held at Mizpah Lodge #302 at 48th and Pierce. Our newest members are Don Shiu, Jr., a banker with Banker's Life, Ed Birmingham, a Professor of Law at Creighton University, and Wayne Stuberg, Associate Director of the UNMC Munroe-Meyer Institute. . .